Overview: During World War II, there is an Army squadron that is sent on various missions across Europe and Northern Africa. These missions are critical to the success of the war effort, but they ask a lot of the soldiers to complete the task. While the squad may be led by the Skipper, the true commander of these soldiers is Sgt. Frank Rock, the strongest man in the U.S. Army. This is Showcase Presents Sgt. Rock Vol. 1. Sgt. Rock is a fairly simple man. He goes where ordered, he leads the soldiers of Easy Company, and he completes the missions. He doesn’t want to be in the war, but he does it because this is his role in life at this point. He would gladly give up his stripes to a better candidate, but he knows that for right now, he is the man for the job. Many of the stories deal with Sgt. Rock having to care for a rookie private recently assigned to Easy. This young soldier is afraid of the war or doesn’t understand how or why Rock does what he does. So Rock shares stories about previous soldiers assigned to Easy who faced similar situations, and how they came through it. Often, these young soldiers come through when faced with combat, inspired by the actions and the words of their sergeant. 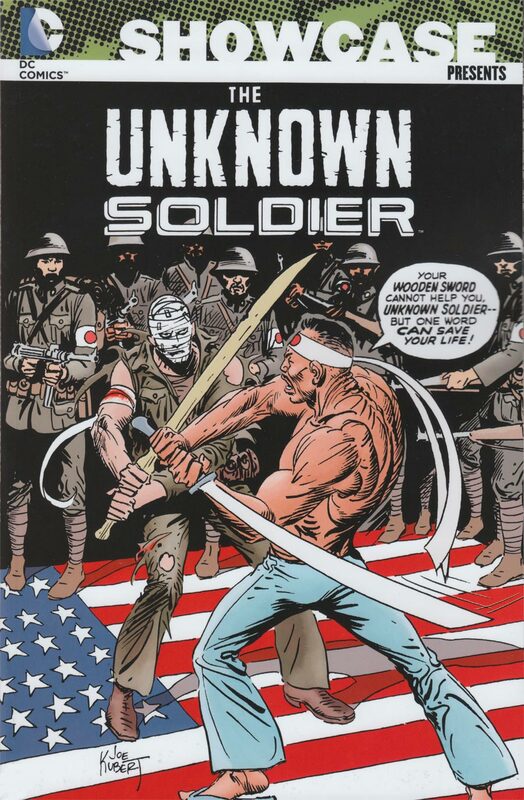 By the end of this volume, we have been introduced to most of the cast of characters for Easy Company, such as Bulldozer, Ice Cream Soldier, Jackie Johnson and Wildman. There are still a few to be added in later volumes, but the core group is in place here. Why should these stories be Showcased? : I really appreciated this volume the more I read of it. First and foremost, the artwork by Joe Kubert is just spectacular. You should get this book just for his artwork. The stories can get repetitive but the artwork carries me through. I just really like to see the progression of the creative team (Robert Kanigher and Kubert) across this collection. 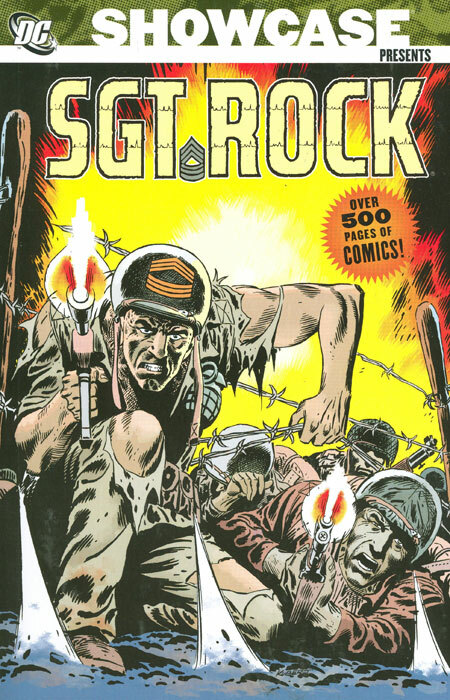 We start out with Rock leading a nameless, nondescript Easy Company, with all of the stories focusing just on his story. But as the story progresses, the other characters are introduced and then brought back over and over, and the title becomes more of a group book. It opens up the story-telling opportunities once we have familiar characters that can be re-used from issue to issue. Footnotes: While this volume collects the earliest adventures of Sgt. Rock and Easy Company, it does not collect the first appearance, which was in G.I. Combat #56 (January 1958). His second appearance in G.I. Combat #68 is included in this collection. If you like this volume, try: the 1998 movie, Saving Private Ryan, directed by Steven Spielberg and starring Tom Hanks and Matt Damon. Beyond the dramatic opening scene of the U.S. troops landing at Omaha Beach, it shows a squad sent on a mission to retrieve a soldier. The squad must walk across parts of France, facing German forces along the way. While there is no direct link between Sgt. Rock and Saving Private Ryan, there were many times when reading these stories that I thought back to the movie. This is a powerful movie, and I try to rewatch it each year in that period between Memorial Day (last Monday of May) and the D-Day anniversary (June 6). Overview: Dr. Bruce Gordon is examining a black diamond when a solar eclipse occurs. The filtered light from the eclipse hits the black diamond, and Gordon is changed into Eclipso. 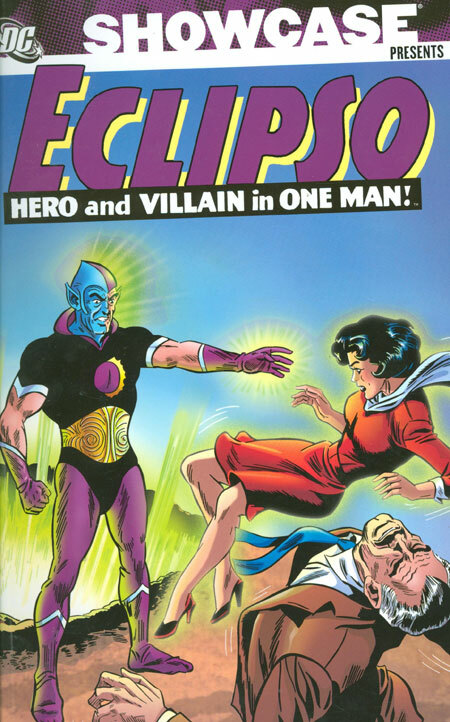 Eclipso is a typical 1960s DC villain, who wants to take over the world without the overly malicious violence. Eclipso can fire energy rays from his eyes via the black diamond, and seems to always have henchmen available for this latest plot. After some period of time following the eclipse, Eclipso reverts back to Gordon, and he is left trying to clean up the mess that Eclipso made. Trying to help Gordon is his girlfriend, Mona Bennett, and her father, Professor Simon Bennett. They are aware of Gordon’s condition, and do their best to help him control the transformations, trying to protect him from the all-too-numerous eclipses that occur in the DC universe. Towards the end of the run of these stories, Gordon/Eclipso teamed up with Mark Merlin/Prince Ra-Man, the co-tenant of House of Secrets with Eclipso. Why should these stories be Showcased? : While this volume gives us the usual assortment of quirky Bob Haney stories, plus art from Alex Toth, I don’t know that this is a necessary volume. When this run ended, it was eight years before Eclipso surfaced again. He was used sporadically for 15 years as the villain of the month, until he became a major threat in the early 1990s. What we think of the character today has very little to do with the stories collected in this Showcase. If DC had collected more of Eclipso’s appearances beyond the House of Secrets run, this might have been a more interesting collection. Footnotes: House of Secrets came to an end with issue #80 in 1966. Three years later, DC brought back the title, but now used as a horror anthology, picking up the numbering with issue #81. If you like this volume, try: digging in the back issue bins to find the DC Annuals from 1992 to read Eclipso: The Darkness Within storyline. This has never been reprinted in a collection, so you will need to search for the individual issues. The series featured a beginning and ending bookend books, and then travelled across various DC titles of the time. Eclipso: The Darkness Within #1 was unique, as the books shipped to comic book stores featured a plastic black diamond attached to the front cover. Of course, this led to damaged comics, the awkwardness of storing the comic, and the cheap glue that led to the diamond coming off of the cover. If you are looking to find the story, these are the annuals to track down: Action Comics Annual #4; Adventures of Superman Annual #4; Batman Annual #16; Deathstroke the Terminator Annual #1; The Demon Annual #1; Detective Comics Annual #5; The Flash Annual #5; Green Arrow Annual #5; Green Lantern Annual #1; Hawkworld Annual #3; Justice League America Annual #6; Justice League Europe Annual #3; L.E.G.I.O.N. Annual #3; The New Titans Annual #8; Robin Annual #1; Superman Annual #4; Superman: The Man of Steel Annual #1; Valor #1; and Wonder Woman Annual #3. Overview: Here we are with Showcase Presents Aquaman Vol. 3, or as I like to think of it, Showcase Presents Aquaman Family Vol. 1. In the same ways that characters like Superman and Batman developed a supporting cast, many of whom had identities starting with the words “super” or “bat”, Aquaman finds himself in a similar situation with his supporting cast. We’ve had Aqualad for years, and the last volume gave us Aquababy. Now with this collection, we get Aquagirl to give Aqualad someone to hang out with. And much like some of the Superman Family- or Batman Family-type issues of the era, we are treated to some ho-hum issues of the Aquaman Family working together to solve some undersea calamity. In addition to Aquagirl, we are finally introduced to Vulko, an Atlantean who would become Aquaman’s trusted advisor. Vulko has become a mainstay in Aquaman comics for many years – whether bringing Arthur up to speed after a long absence from Atlantis or sitting on the throne as king when Aquaman finds himself ousted from his home. But the highlight of this collection is the completion of Aquaman’s Rogues Gallery. The two villains most associated with Aquaman make their first appearance in these issues. We find out that Ocean Master is Arthur’s half-brother, which creates a new set of struggles for Aquaman, who has very little blood relatives in his life. It’s hard to love your family when they are trying to kill you every other issue! We also meet Black Manta, an angry man that wants nothing more than to take down Aquaman. 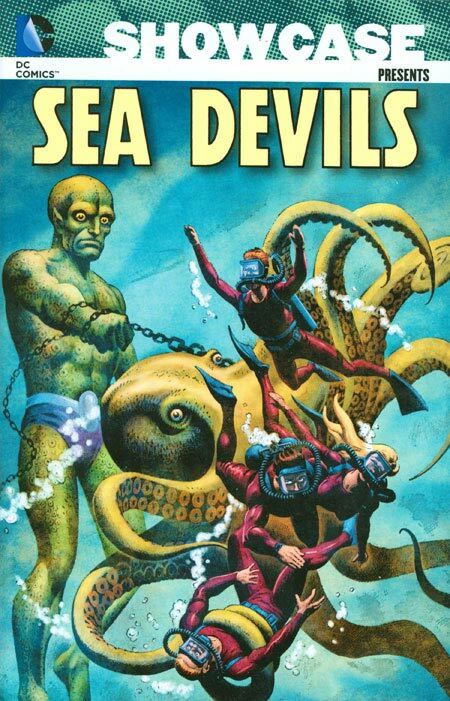 Both of these foes have become mainstays not only in Aquaman’s universe but in the DC Universe proper. Another minor villain is introduced in the Scavenger. Truthfully, you probably have read stories featuring Scavenger. He’s just not that memorable of a character. 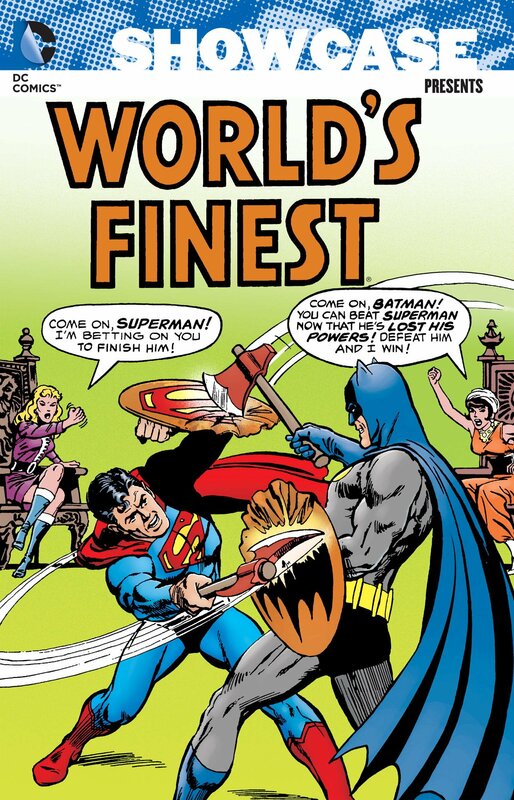 This majority of this collection is written by Bob Haney and art by Nick Cardy, two names that are very synonymous with 1960s DC Comics. We do get a rare non-Batman issue of The Brave and the Bold, as Aquaman teams up with his fellow Justice League member, the Atom. Why should these stories be Showcased? : This is a hit-and-miss collection for me. When the stories are good, they are great! Some of these issues make me believe that Aquaman could be a top-tier character. But then you get a not-so-good story, and those sink to the bottom faster than the Titanic. It’s almost like they found an unused script from a few years prior and decided to run with it. I’m not trying to bash those issues. I’m sure someone out there really enjoyed them. If you like this volume, try: the Aquaman: Death of the Prince trade paperback from 2011. OK, as of the writing of this post, DC has not released a Showcase Presents Aquaman Vol. 4, which is a huge shame! Beginning with issue #40, Jim Aparo took over as the series artist, providing a new definitive look to Aquaman and his family. The series ran until #56 in the early 1970s. 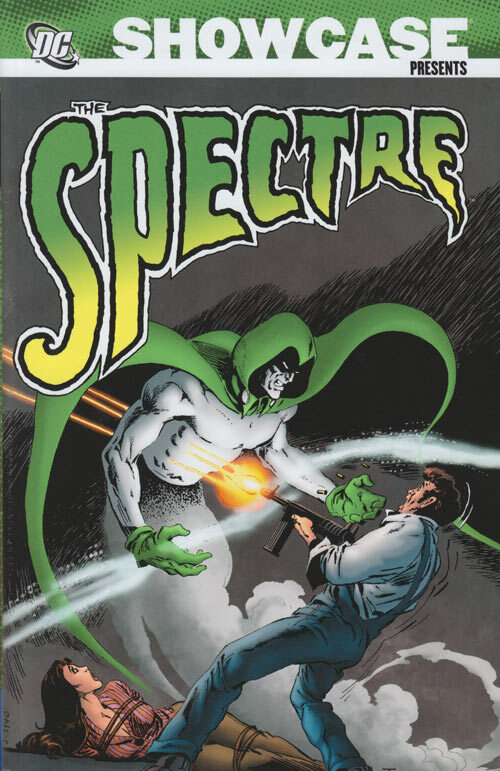 In the mid-1970s, the series resumed with issue #57, and kicked things up a notch, as evidenced by this trade paperback title. The Aquaman title ran until #63 (thanks DC Implosion! ), but Aquaman’s story continued in the pages of Adventure Comics. As I noted in my review for Volume 2, Aquaman was one of the first characters that DC actively developed and pushed forward story lines featuring major life events (marriage, birth of a son, and now death in the family). 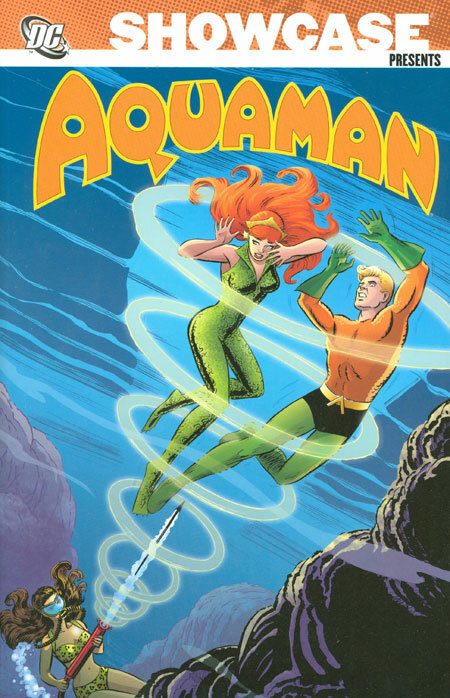 This is a great volume to track down to read Aquaman’s tumultuous adventures from the 1970s.